« Transition Blue Mountains to screen “Our Generation” film. Down the hill a little from the regular beat here, but an opportunity to hear one of the founders of the permaculture movement (with Bill Mollison) speak. Permaculture pioneer David Holmgren will be in Lawson this month as a guest of Permaculture Blue Mountains. 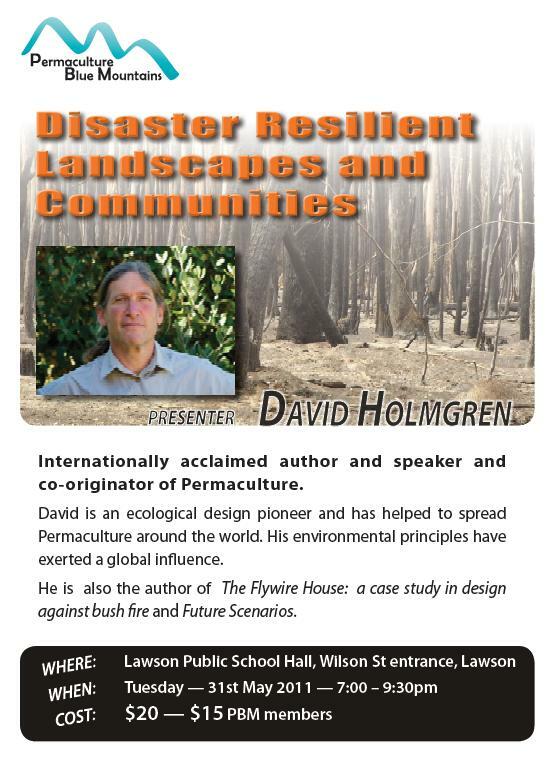 David – a leading thinker in ecological design and the author of Future Scenarios and The Flywire House: a case study in design against bushfire – will speak on disaster resilient landscaping and communities. This entry was posted on Monday, May 23rd, 2011 at 4:32 pm	and is filed under Events. You can follow any responses to this entry through the RSS 2.0 feed. You can skip to the end and leave a response. Pinging is currently not allowed.